Buying an oven will be one of your biggest kitchen purchases; it’s worth getting clued up on all the different types by reading our oven reviews and getting to grips with our buying guide. It’s the kind of appliance that you don’t want anything going wrong with as it will be both tricky and expensive to fix. Make sure you know exactly what you are getting yourself into when you make your decisions and always be clear on warranty periods. To help you buy the best oven for your needs, we’ll be covering fuel, function and design. Check out our reviews below for inspiration. Oh the power of hot air! Fan, fan-assisted, or convection work by circulating hot air around, making for a more efficient cooking environment. Rather than just relying on the walls heating up and radiating heat around, convection setups actually propel hot air around the food. Convection ovens are usually energy-efficient and are easier for home cooks because you won’t have to bother with moving food around inside and you’ll get a more even bake. They can be fuelled by either electricity or gas, but electricity is increasingly becoming the norm. Fan or convection ovens can either be solely fan ovens, or they can be multi functional ovens that have a fan function. Now the confusing definitions are out of the way, read our reviews of some of the best fan & convection ovens. Thanks to the flexibility of both conventional and fan heating, this oven will cover all of the meals and treats you need to cook. If you’re making a big Sunday roast for the family, then there is ample room with the 71 litre capacity. Or, if you’re getting your bake on and making some cupcakes with the kids, the multi-dimensional cooking ability will leave them coming out evenly cooked. After a few dinners and Saturday morning grilled bacon butties, your oven can become a bit dirty and greasy, so it is usually time to give it a bit of a scrub. 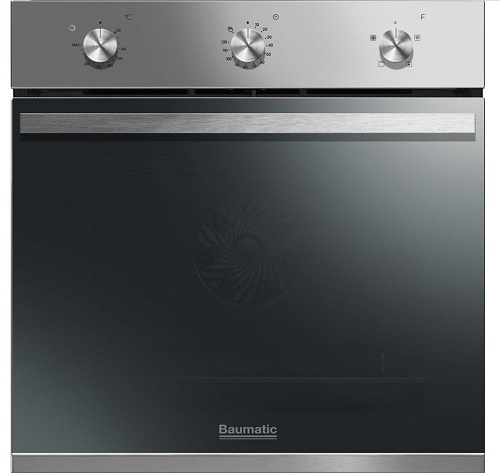 However, this Beko oven features SimplySteam, which will remove any burnt-on food and grease. All you have to do is fill the tray with water and leave it on to do its work. When working with the catalytic liners of the oven, this should make your life much easier. Touch control makes the whole process much easier to manage, so there is no awkward bending over to check the dial is on the right temperature setting. You can even programme it to start cooking up to 24 hours in advance, so whether you know you’re going out tomorrow morning and want to have lunch ready for when you come back or want your dinner after work with no hassle, the oven has you sorted. 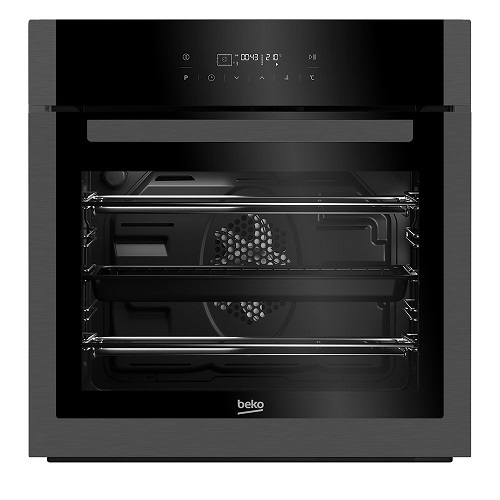 Clean, modern-looking and simple to use, this Beko oven will slot into any kitchen and home with ease and cooking will no longer be a task. Going for a double convection oven is a great way to maximise kitchen space. And this Zanussi number gives you over a 100 litres of space (can’t argue with that). The fan ensures heat is distributed evenly and thoroughly, resulting in proper and even cooking. Because there are two chambers, you have plenty of room to cook the largest of meals all year round. Hate cleaning your oven every so often? We all do, especially after some grilling or after a slight spillage. Thankfully, with this oven, the catalytic StayClean oven lining means you don’t have to grab your Marigolds. Just give it a wipe every week and it will remain looking like new. If you have little ones running round then the auto-stop anti-tip shelves and heatproof glass door will keep them safe and prevent any accidents. It looks stylish, has heaps of settings and is quality. Just beware that as it is a double oven, if it is placed very high it may become difficult to view the controls. One of the best currently on the market, fantastic build quality and value for money. This multi-functional oven is perfect for busy family homes. Boasting an LED clock, programmable timer and seven different useful functions including a defrost setting and a pizza function, it makes cooking easier than ever. There is a generous 65L capacity which will help you prepare large family meals as well as batches of sweet treats at the weekend. Whether it be a roast chicken or cookies, this Hoover model has a function which will ensure they come out absolutely perfect. Cleaning the Hoover HOC3250IN couldn’t be easier, with easy clean enamel surfaces and a steam cleaning system so you’ll never have to spend hours soaking and chipping grease off this appliance. Just fill the reservoir with water and leave it to work its magic. With the help of the steam, food residue loosens, which also reduces the chemicals you use. For the price, this is easily one of the best ovens on the market. Cleaning, cooking and fitting is easy, leaving you to get up to the more important things in life. The perfect choice for those who want their cooking experience simplified. Stainless steel, easy to clean and looking modern, this Beko model is a firm favourite among reviewers. Firstly, it has a large capacity of 71 litres. This makes it perfect when you have guests and need to feed a large group of people. Better still it’s in Beko’s EcoSmart range, meaning that it will reduce energy consumption while not compromising on cooking quality – all whilst cutting running costs. The fan allows food to cook evenly, no matter which shelf it is sitting on. The entire cooking chamber will be the perfect temperature. A programmable timer allows you to cook the dinner to a precise level, so you can get on with other things without having to keep an eye on the clock. Designed to fit within an eye level cabinet and with a handy LED display, this is one of the most stylish and appealing options on the market for the price, which also includes a 2 year manufacturer’s warranty for your peace of mind. This large capacity oven is perfect for big families or having guests over, being in the EcoSmart range means reduced energy consumption which in turn will lead to savings over time. Hoover have given us a modern black and silver single convection oven here, with easy dials and controls. The perfect user-friendly addition to your home. The electronic display is both easy to navigate and see, while adding a touch of the latest technology and design. A 65L capacity will allow you to cook for guests and gatherings without cramming all of the food in. Plus, touch controls help you to get everything just right, while offering a flat surface so cleaning is a doddle. Talking of cleaning – everyone hates it when something spills over in the oven, or some cheese drips down from the cheese on toast in the grill. You’ll likely leave it for weeks as it is too much hassle to scrape off, as you just hope that the burning smell disappears. Well, thanks to Hydro Clean technology, all you have to do with this oven is pour 300 ml of water into the recess at the bottom of the oven and set to the relevant programme and temperature. It seems a bit slow to heat compared to other similar models of the capacity, but this is still a stylish family model at a good price point. Overall a great oven, does what it says on the tin and will keep your kitchen flowing. Buying a double oven means having twice the fun in your kitchen. They are brilliant for bigger family kitchens and will be appreciated by ambitious home cooks who need some space to perfect their Sunday roast. Having one of these means you can easily have multiple dishes on the go – grilling on the top, whilst roasting other food on the bottom. Some twin ovens also offer double grills if grilling is really your thing. Here we’ve reviewed the best double ovens that would be great for any family kitchen. Whether you are after a stainless steel or black hue, this Stoves oven will not only look the part but also keep your cooking in check. Because it is a double oven, it offers two different cooking types. The first, a main fan oven, is perfect for thorough cooking and batch baking, as air is circulated evenly. The second is a conventional, where heat rises from the bottom, giving you crisp outers yet moist or fluffy insides. In this second chamber, you also get a handy grill, which is ideal for quickly cooking off some fish fingers or adding a crispy touch to your cottage pies and lasagnes without affecting the cooking. If you are worried about safety when it comes to your large kitchen appliances, then the soft close door will be music to your ears. No more trapped fingers, or loud bangs which disturb everyone else/risk damage. The grease-proof enamel interior just needs a wipe to keep it clean once cool, so you won’t spend one weekend every month scrubbing away with a Brillo pad. Other features which will no doubt appeal include a slow cook setting, dough proving function, and the ability to just use half the grill at once. Capacities are generous, and the fact that both can be used at once will no doubt help if everyone has different tastes and requirements when it comes to dinner time. For a product from the Stoves name, and which is so great at what it does, the price is very reasonable indeed. Boasting a huge cooking capacity yet easy to use and efficient to run. This stylish and easy to navigate double oven is a must have if you have the space (and money). We love the fact that it gets the job done fast and doesn’t make too much of a fuss in the process. Preheating is done quickly but quietly. The main oven gives you a spacious 71L capacity, while the 35L secondary oven is equally roomy and allows you to get everything ready at the same time. 3D hot air cooking technology in the main chamber gets your food cooked to perfection. No more under or overdone meals served at your dinner table. The heat circulates around the oven incredibly well, plus the triple glazed door ensures that not a single degree of heat will escape. The rotary dials are easy to navigate and relatively well marked to help you get everything right. Just leave it up to its job without lifting another finger and take all the credit when it is served. A great quality buy, this is a nifty double fan setup that is both smart and efficient. The price is high, but you are technically getting a bit of a 2-in-1 item. This Indesit model has some great functions and it’s nice to see a double oven where both of the cavities have been given A ratings for energy efficiency. We love that you can get a built-in double electric setup with seven cooking functions priced this near the £300 mark. Choose between a fan and convection setting to cook your food, depending on the contents of the oven. There is also a grill, and a slow cook function if you’re a fan of casseroles but don’t have the space for a dedicated slow cooker appliance. For easy cleaning, the catalytic liners help to absorb fat and burnt on food and then oxidise them at a high temperature, so they form a wipe away liquid. Scraping and brushing ovens can cause a lot of damage, so this should help keep the Indesit with you for years to come. The digital timer adds the final finishing touch, helping you to stay in control of the recipe. This Indesit is a real budget buy for the sheer amount of technology you get. Fantastic quality for the price, this will not disappoint. We love this electric double oven from AEG. With its sleek design and anti-fingerprint coating, this model is perfect for busy kitchens or those who need more than just a single oven. The two separate cavities mean that different foods can be cooked at the same time and allows for catering for larger families or dinner parties. The heat is also evenly distributed, so you don’t have to worry about the back of the dish being burnt whilst the front is still undercooked. The catalytic cleaning feature makes cleaning this oven quick and easy, with the grease and fat being absorbed by liners and oxidising, so no need to spend hours scrubbing the grease off this oven. Easy touch controls make choosing your settings clear and comfortable, and you can set the time and check up on the progress of your dish. Perfect for bigger families who need the extra space of 2 ovens. Download the AEG SurroundCook DUE431110M user manual here. Built-in ovens are fantastically versatile cooking appliances and are becoming increasingly popular with style-conscious cooks. Built-in ovens are great because they can seamlessly sit within your kitchen units, blending in with your overall kitchen design. There are many different built-in options: wall ovens sit at eye-level, often in custom-designed kitchen cabinets, whereas built-under ovens are made to fit under kitchen worktops. Having a wall oven at eye-level can make it a lot easier to use, but some people still prefer a traditional built-in setup that sits beneath a worktop. Integrated wall ovens certainly make a stylish first impression and allow you to play around with your kitchen design a bit more. Read our reviews and see what kind of oven takes your fancy. Oh, Smeg. Putting others to shame with your features, functions and flashy design. This Smeg oven is the latest in luxury design and usability. Packed to the brim with loads of amazing features and functions, there is actually an integrated pizza stone moulding so that you can make your own pizzas and flatbreads. Magical. As for the more basic and necessary functions, there are 12 functions, 20 automatic programmes and five cooking levels which will help you cook absolutely anything from a well-risen bread to a massive batch of brownies or a whole chicken. Pyrolytic cleaning ability will allow you to keep all those cleaning products safely in the cupboard under the sink. Just remove the shelves, turn the dial to the setting and watch as the oven heats to around 500 degrees and liquifies any burnt on grease or debris. Allow to cool, then wipe away with a damp cloth. The price may be slightly high, but you are paying for both the quality and the name. You get a whole host of accessories with the purchase too, including a pizza stone and grill pan. Plus, you can choose from four colours. Plenty for the money. What other ovens can do proper pizza too? More than just a gimmicky luxury oven with fancy features, this is a feature of real solid kitchen design and engineering. You’d be forgiven for thinking that a single cavity oven can only accommodate one temperature at any one time. However, Samsung have answered all of your prayers with this fancy futuristic combination oven. Thanks to the unique dual cook feature, you can actually use the main cavity at different temperatures. And at the same time. Upper and lower cooking zones will help you independently cook various dishes, with different time requirements too. Or, just use it as a standard single oven for those larger dishes. You won’t struggle to fit everything in, thanks to the very generous 75L capacity. Pyrolytic cleaning technology will heat up any burnt on grease and grime so you can give it a simple wipe rather than needing to chip away at it for hours. We love how this Samsung uses the latest technology to give you a solid and practical setup that delivers on quality and usability. As a bonus, the shelves were incredibly easy to slide in and out even with heavy items on top which will reduce the risk of any spillages or burns. We liked everything about this setup! Brilliant functions and clever use of technology makes this a winner for us. If style is a big priority for you then you can’t get much better than this offering from our favourites at Smeg. We love the smooth curves and its clear mirror finish. It has definitely been made for the houseproud cook. Okay, it isn’t for everyone, as it definitely goes against the grain, but if you love the smooth almost hidden away look then it’s a winner. Don’t panic about it getting dirty though, as there is a mark resistant coating. Not only do you get two compartments to help accommodate your entire meal, but there is also a generous 70L capacity. No matter what you’re whipping up, there will be a cooking method available to you. From Circulaire fan cooking for the foods which require precise thorough cooking to a defrost feature, you get a lot for the money. Non-stick enamel liners help to keep burnt-on food at bay and make cleaning ever so easy. There are air cooled doors so you don’t have to set up a cordon when it is in use to prevent people from touching it, and the electronic timer will help you stay in control when you have a to-do list as long as your arm and can’t keep an eye on the clock. This gleaming double oven delivers on size and quality of the cooking. A really great choice for a busy family kitchen, this looks and is good and all things considered, the price isn't half bad. A quality integrated oven, this Stoves offering would fit in nicely in any family kitchen under a worktop. The main chamber circulates heat well thanks to the in-built fan, so whether it be a lasagne or a casserole, there will be no worry about it being both under and overdone when it comes out. There’s a timer to help you cook to perfection – handy if you’re one to lose track of time. The upper chamber features a grill function, so finishing your meals off or having a quick cheese on toast is within easy reach. If some of this cheese happens to drip down onto the base of the oven, the grease proof enamel interior will ensure it doesn’t burn into the oven, so you can wipe it away once cooled. Removable inner door glass will help keep this see-through with an occasional clean, and it is also double glazed so heat stays right where it should be. It isn’t the prettiest to look at, but when considering the high performance, this is definitely something that shouldn’t put anyone off. A quality integrated setup, designed for fitting under worktops. For the price, the performance is high. Gas ovens are great – we all love the nostalgia of striking that match and the warm cozy smell of a gas model on full pelt on a cold winter’s morning. Cooking with gas is very important to some people and gas is often used by professional chefs who tend to cook on gas ranges. Though electric alterantives have been taking over recently, many still feel that gas is better. Gas oven technology has come on in leaps and bounds in the last few years and new gas cookers are very tightly regulated and controlled. It’s much easier these days to get an even temperature with gas as designers continue to innovate and improve on earlier cookers. It not only looks amazing, but it’s packed full of extra features like telescopic shelves, triple glazing and an extra deep tray. Perfect for both style and substance. As is typical of Smeg, this model features smart glass panels (rather than seethrough) that light up when in use, making it look stylish and sleek. Eight cooking functions, including fan and rotisserie, will tackle any meal or baked good you throw at it. The telescopic shelves allow you to check on food without removing it. This increases safety and allows it to stay warm. Grilling is done with the door closed too, which we know isn’t a rare feature, but still very welcome. An LCD display and Canali controls will help you set everything with precision. In terms of cleaning, the enamel interior and removable inner door glass make keeping this gas oven clean a breeze. No harsh chemicals, scraping or fighting through the smell of burnt on grease any longer. We think it is well-priced for what you get, in the middle range yet high up on the list of ovens packed with the best features. Nothing, we love this gas oven! We certainly took a shine to this Smeg gas setup. We love the rotisserie cooking function and the smart glass panels that light up – a great kitchen appliance investment. This stylish number from Stoves combines the quality of a gas oven with the precision of an electric grill, which certainly makes things easier for the user. Great for smaller families or couples who aren’t looking to cook huge joints of meat. Because it is a conventional oven, the heat rises from the bottom upwards so it is perfect for baking cakes and cookies at the bottom. The double glazed door will retain heat, and is easy to wipe clean so it remains seethrough. An enamel interior makes wiping clean simple, and will also ensure that the coating remains intact under the heaviest of use. As there is only a 48L capacity, it isn’t the biggest on our list, but not everyone needs a huge oven that can accommodate roasting joints and huge casserole dishes. If this is you, then both the price and size of the Stoves cooker will appeal. A lovely small setup with a powerful electric grill, this Stoves is a great family kitchen appliance which won't let down even the most demanding of users. Some people say gas hobs are better, but electric ovens are starting to take over as Britain’s domestic ovens of choice. Easy to maintain and install with more even cooking temperatures, we can see why. Electric options are versatile and safe, and can be programmed to work in a number of different ways. It’s their wide array of functions like combi grill, rotisserie and various settings that make electric ovens so user-friendly and give you that nice even bake. Electric setups can ever so slightly bump up your utility bill, so always go for an energy efficient model if you can (A rated or better). For a pretty fantastic price, this built-in Baumatic oven is a bit of a steal. There are plenty of extra features to both keep you happy and make life easier. Enamel coating makes cleaning easier and also protects the surface from any damage or scratches when you’re inserting and removing baking trays. A double-glazed door adds that little extra safety, ensuring it is both cooler to touch and keeps the heat where it should be. Obviously, a little bit of heat does still radiate as with all ovens and cookers, so always keep little ones out of harm’s way. You have the ability to remove the inner pane of glass for easier cleaning when the time comes. A manual timer can be set so food doesn’t burn, and it also switches off after use so no forgetful individuals can leave it on overnight. This must be on for it to work as well, so there will be no accidental knocks of the dial. Overall, there are plenty of functions, including baking, grill and fan, intensive baking and top heat. Great for preparing a whole host of dishes and cakes. The safety shelves prevent themselves from being pulled out accidentally which could result in a nasty accident or some wasted grub. Thanks to the inner fan, air is passed over the heating elements which means a more even cook. Put short; it won’t let you down in any shape or form. For under £200, a big-name oven is that bit more possible. You also get a fantastic five-year manufacturers guarantee which should cover all of the basics if anything were to go wrong, which is even more value for money. For the price, it is fab. Even if there were downsides, they'd be the type you'd happily put up with. 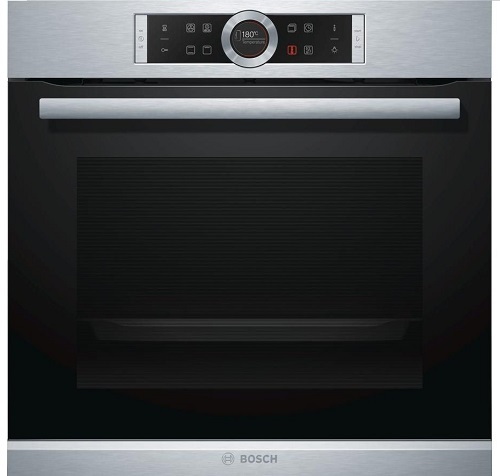 Packed with all of the cooking functions you could ever wish for in an oven, this Bosch model will make all of your kitchen dreams come true. It is large in size, able to hold over 70 L at once, so there will be no issues trying to fit everything in. There are 13 functions, taking you from conventional heat and full and half-width grilling to a dedicated pizza setting, hold warm and defrost. A unique function is 4D Hot Air, designed to provide equal amounts across all four shelves thanks to the alternating fan. This allows you to cook different dishes at the same time, but provide excellent results. The touch control and LED display screen brings a bit of modernity, not only looking sleek in your home but also being much easier to clean than those with dials and switches. Talking of cleaning, the EcoClean Direct catalytic coating of the chamber will reduce the need for any hard scrubbing every month, as every time the oven is on it works to remove the dirt build-up. Just wipe the door and bottom of the oven, and the coating replaces itself. For safety, the door is soft open, and there is a childproof lock. A residual heat indicator will also tell you whether the oven is still a bit hot so that you can keep the kids out of the kitchen in the meantime. It is pricey for a single cooking appliance, but the sheer number of features, safety considerations and the overall look makes it a very worthy purchase in our eyes. It takes a while to become familiar with, so any initial frustrations with the turn dial and settings will subside. Despite the slight niggles with the lack of user friendliness at first, once you get in the swing it is a great option and will see you through cooking well. You want an oven which is affordable, but still has some of the fancy settings and control of one at the high-end of the scale. Look no further. Not only does this Newworld oven look nice and modern, but navigation is also easy thanks to the clearly marked settings and timer buttons. There is an interior light so you can keep track of the cooking without opening the door and see everything clearly, and the removable glass door offers easy viewing too. A ceramic interior will keep any spills at bay and make them easy to keep clean with a simple wipe. There is a cooling fan which will keep the door cool so you can touch it while it is on – handy if there are any little fingers which you need to protect. Unfortunately, it is open door grilling which is something which is rare with modern models and, to be honest, we like to keep smoke and smells at bay. Nobody likes a house that smells of grilling. We also found the temperature settings a little baffling, with numbers and markers dotted about in a way where you need to take a second look to ensure you’ve not set it too low. Still, it is a nice price and if aesthetics are a top concern, it will please. Great budget buy with fantastic features that you wouldn't expect to get for the price. The little niggles we have are easy to get used to, and certainly won't put you off using it. An integrated, stylish design and nine different cooking functions make this a great choice from a highly-respected appliance brand. Cooking with this is truly a pleasure. Miele’s commitment to quality means that it’s not only supremely stylish but durable too. There is a 76L capacity which makes it one of the largest we have featured – ideal if you need space but don’t have space for a large Aga-style oven. One of the functions is a high moisture setting, so when you’re roasting meat it won’t dry out. A speedy cooking setting will also even everything out to ensure your meal is delivered quicker but safely. Electronic sensors monitor the progress. A Pyrolytic enamel interior is pretty much self-cleaning. All you have to do is wipe it after use to ensure it remains as good as new. There is a cooling fan which keeps the door and dials cool to touch to prevent accidents, and the double glazed glass retains heat so your food is cooked to perfection. It is priced rather high for an oven of its style. But the capacity, navigation and ease of use makes it slightly understandable. If you’re looking for an oven which is an investment as opposed to something which will do for a couple of years, we have no doubt it will last. Once you go Miele PureLine, you don’t go back. The specs speak for themselves, and the price becomes understandable after a few uses. Another solid offering from Hotpoint, this is a great high capacity multifunction oven with an A+ energy rating. You’ve got quicker cooking with MultiFlow technology, which gives you an even temperature for the best results possible. A full width grill will help you focus on the areas which matter the most, from crisping up lasagne edges to grilling your cheese on toast. One feature which we couldn’t stop raving about – the grill element is tiltable downwards. So, when you’re cleaning, you can access every surface. No more working around it to get rid of those upper grease splashes. Because there is a 71L capacity, it is great for those busy high demand homes where the oven never seems to be off and teatime is a task. Yet, the A+ energy rating will help to keep the energy usage and bills low, so you don’t have to worry about it being on for long periods. This oven saw Hotpoint team up with Jamie Oliver, and you can tell. It is an appliance which has been designed with cooks in mind. Instructions are a let down and it is slow to heat up. But inevitably worth the wait and time spent getting to grips. Energy-efficient A+ rated double oven, easy to use, packed with features, huge capacity - we could go on. Perfect for larger families. From the Jamie Oliver Hotpoint partnership comes this built in electric single oven. It is ideal for cooking all of your favourite meals with minimal effort. This model sports a programmable timer which can be set to automatically shut off the oven when the food is ready. No more burnt chips or dried out chicken, without you lifting a finger. The pyrolytic self-cleaning setting reduces leftover food and grease to ash, allowing you to simply wipe it away. Great for anyone who wants to cut out harsh chemicals and elbow grease. Cooking options are aplenty, with options for roasting meat, baking sweet goods and grilling some perfect bacon. Multiflow technology guarantees that no matter the setting, the hot air will reach every corner of the oven so your food is cooked just the way you like it and, most importantly, safely. You only get one wire tray, and the fan setting seems a little noisier than most alternatives, especially others in the range. But we will simply say that it is easy to put up with as you get high performance in return. Cheap ovens these days are easy to come by, whether you are looking for gas or electric. Buying a good oven on a budget doesn’t mean a huge trade-off in quality if you know what you’re looking for. Sure, when buying cheap you will have to balance size with quality and style, but it’s totally possible to get a fully functioning setup and a good deal at the same time. To really drive your price down, you’ll need to trade in ceramic hobs and stainless steel doors in for more humble design. We’ve gathered some great cheap options for the money-conscious cook. We cover electric, mini, and we’ve even included a budget-buy oven for those who are looking to make a big saving with their kitchen appliances this winter. An excellent budget option for any kitchen, the Candy FCS201N multifunction oven is perfect for preparing a range of dishes. We love the sleek black finish, which is basic, clean and will look great in any kitchen – and for under £200. The grease proof enamel coating means that this appliance is easy to clean and won’t require hours of endless scrubbing. It should stop grease sticking, so as long as you wipe it frequently, there should be no issues. There is also a lot which may appeal to busy homes with busy people. A 71L capacity is plenty to get entire meals cooked in one go, and the conventional heating is great for every food from sponge cakes to beef joints. Our only problem is that the temperature markings jump up in 25 degree steps from 100 degrees. As most recipes call for 180 or 190, it takes a bit more fine-tuning and monitoring than we’d like. But for the price, it isn’t a big downfall and doesn’t affect performance once you get to grips. Excellent value for money, an easy to use budget option for any home. A built-under double setup like this offers great value for money when trying to pack as much as you can into a small kitchen space. Not only that, but it is modern and cleanly-designed too without being too in-your-face. The top compartment is reserved for smaller dishes and grilling, while the bottom of this double is perfect for roasting joints or larger oven dishes. The larger cavity is fan operated so the heat spreads well and quickly. Great for ensuring your food is safe and cooked to a tee. If you’re making cookies and anything else which requires heat to rise, the smaller cavity is perfect. When you need to grill to add a golden finish to your oven baked dishes, just turn the dial and you’ll be ready to switch everything over in seconds. If you set the electronic programmable timer, it will turn off the oven when it is done. You can rest easy knowing that you won’t overcook everything if you lose track of time while watching TV. Designed to fit in an eye-level unit, it won’t suit every home. But if this is what you’re after then the price, energy rating, usability and extra little functions are great. If Jamie Oliver approves then what’s not to like? Great for everyday cooking, this is a good double oven that takes a while to get the hang of but won't let you down when done. A fabulous pick if you are after a budget buy without having to forego performance and quality. It’s cheap and cheerful; you won’t be getting any additional cooking functions, but it’s a reliable and purse-friendly buy you can’t go too wrong with. You still get a generous 66L capacity, which is enough for all of those evening meals which require a lot of cooking space. The fan system spreads the heat throughout evenly, and from our tests, it seemed to pre-heat nice and quickly too. Nobody likes standing around waiting to get going after a hectic day at work. The grill also was great quality with good heat distribution too. It covers the width of the oven, so all of your bacon will fit in comfortably in one go. While everything is cooking, you can check on the progress using the interior light and large clear glass door. Constantly opening the door increases cooking time, so again it makes for a fast appliance. You get two shelves plus a grill pan – luxuries which don’t even come with some ovens 5x the price. We’d have liked if the temperature dial was a bit clearer to set, but after a few goes it is easy to get to grips with. Some may say you can’t expect perfection for this price, but we’d have to say this Logik comes close. 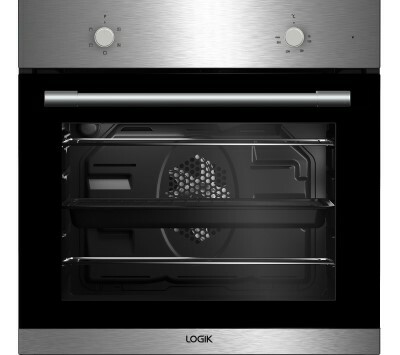 Simple electric oven, this Logik is a good first buy for anyone with a new house who isn’t looking for anything special and just wants to get their kitchen kitted out fast. Likewise, it is perfect for families who's budget won't quite stretch to paying much more. We’ve recommended some great deals from across the UK’s biggest and most trustworthy brands, but before you commit to your big purchase, you may want to shop around further. If this sounds like you, feel free to use our buying guide to help you make the right decision. Ovens are separated out into many subcategories that you may find confusing at first. The main categories you need to know are fuel and function, followed by design and dimensions. Initially, you will have to make a choice between an oven that is fuelled by electricity or fuelled by gas. Then you will have to make some decisions on what cooking functions you’d like best, and what sort of oven design will fit in with your existing kitchen design (built-in or standalone). You will also have to consider how much space you have to devote to your oven, and how you will manage the installation process. Often you’ll need professional and qualified engineers to do the fitting – it’s not something you should be attempting on your own without any professional assistance. Both electric and gas ovens will have different cooking functions like grill, fan, etc. Different types offer different cooking functions. The oven type is the general category of oven, like conventional electric or fan-assisted electric. These types will then be broken down into functions like fan-assisted grill, electric grill, fan oven, fan-assisted gas oven, etc. A function determines how the oven heats up and will influence your cooking results. Most setups offer a number of functions, with fan ovens and grills becoming increasingly standard. The benefit of fan-assisted cooking is a more economical way of cooking and a more even bake. A combination oven has many different types of functions, like fan, electric grill, microwave etc. A combination oven may have the edge over a single function oven as it allows you to be more versatile. Most standard ovens these days come with a variety of oven functions, but only ones that offer microwaves are generally called combination ovens. This can be a great option, but you might have to trade off some oven power. Read our microwave and combination oven reviews here. A built in oven means that you can integrate your oven with the rest of you kitchen design, either fitting it under a worktop or at sitting it in a special eye-level cabinet. It depends really what you think looks best in your kitchen, but fitting an oven in an eye-level cabinet means that you will need to set your hob on a separate part of the kitchen worktop. A standalone model is also a good option as it will make for less work during installation and is a popular choice in managed properties as it offers an easy ‘all in one’ solution. An oven range is pretty much always standalone, as it’s such a big bit of kitchen kit. Designs also vary in terms of colour and design. A classic white enamel oven is joined by black, stainless steel and even mirrored glass ovens. It’s possible to have coloured and quirky ovens too, with red and cream being popular appliance colour choices. Luxury ovens come with an impressive array of features like pre-programmable cooking programmes, self-cleaning pyrolytic lining and even integrated pizza and flatbread features. A luxury oven from one of the best brands will look a lot more high end and will be finished off to a higher standard. More expensive choices are made from better materials and have longer warranty periods. On the other hand, a basic oven is often good enough for standard kitchens and cooking, and you may not need all the bells and whistles that a fancy one offers. A budget oven can be a good purchase, but make sure you read lots of reviews before making a purchase decision. (Here are our reviews of cheap ovens). Replacing an appliance is time-consuming and expensive, so it’s often best to aim for mid range ovens and cookers, and to sign up for any warranty periods. You don’t want anything going wrong with your appliance, as it will be a huge hassle to fix. A single oven has one cavity, whereas a double oven will have two. Often double ovens have a main cavity that will roughly be the same size as a standard single oven, with a smaller oven sitting on top that will double up as grill. A double is best if you’re planning on doing lots of complex cooking, or prefer a bit more space for your family meals. Often shared houses will have double setups. Being more efficient with the energy you use is better for the environment, and best of all better for your purse strings. All cookers are rated on a universal EU energy efficiency scale, with A+++ being the highest energy efficiency standard. An energy scale like this makes it easy for you to tell at a glance how energy efficient your appliance is. The Energy Saving Trust recommends that you look for A rated ovens as a “new A+ rated electric oven will consume 40 percent less energy than a B rated one”. Read more about energy efficient appliances on Energy Saving Trust’s website. Deciding on what is best for you depends on your kitchen objectives and habits. Some people review ovens from a very functional perspective, others need a little more from their cookers in terms of design and brand. Do you need a double or single? What sort of features and programmes are you likely to need on a regular basis? Does it make sense to pay extra for them? How important is quality and design to you? What about the brand? Do you need any extra safety features? Have you read enough reviews to make your decision? Compare oven ranges at different retailers – you’ll be surprised at the differences in pricing. Don’t get blinded by a fancy brand, dig deeper and look at product specification and reviews to get a real picture of the best appliance for you. Most ovens need to be installed by a professional and licensed engineer. You are dealing with complex parts of your home like the main gas or electricity supply and you really don’t want to mess either of those things up. Ovens can be some of the dirtiest and hardest to clean appliances in our kitchens. Left to their own devices, they quickly become caked in dirt and grime. It’s important to stay on top of cleaning to best extend the lifetime and value of your appliance. You will want to have frequent mini cleans, as well as deep cleans and scrubs. You won’t always need to resort to harsh chemical cleaners either, there are plenty of natural ways to remove grime and grease. What’s The Difference Between An Oven And A Cooker? These words are sometimes used interchangeably, but technically cookers would include the top hotplate known as the hob. An oven is strictly speaking just the oven cavity used for cooking. What Is A Built-In Oven? A built-in oven is one which can be fitted under a kitchen surface, or integrated into an existing wall design as part of a custom cabinet. Sometimes built-ins are known as wall ovens because they sit in the wall. Is Gas Better Than Electric? Not necessarily, but gas is sometimes preferred because it provides a faster and potentially more ‘authentic’ cooking experience. This is because you can easily control the flames on the hob and it can get up to temperature quicker. A gas setup may actually be slightly more unreliable than an electric one, though. Are All Ovens A Standard Size? No, they come in many shapes and sizes and vary based on the brand and design. Dimensions are usually given in centimetres, with an internal capacity given in litres. The best ways to get a feel for an oven is to know your current oven’s size and compare that, or go and see some models in a showroom. Which Ovens Do Chefs Use? Chefs use huge ranges in commercial kitchens. These are often custom built, and tend to combine gas tops with electric ovens to combine speed with even cooking. We have reviewed some of the best for home use on Appliance Reviewer. Which Ovens Are Best For Baking? Baking benefits from an even temperature to encourage an even bake. An electric fan setup is probably the easiest and best for bakers to get to grips with. Gas setups are good because gas lets off some moisture, but again you might struggle to get a consistent temperature. There are a few models out there which excel for bakers, and it is a top selling point. Who Services And Installs Ovens? It depends whether it’s an electric or gas oven, but generally it will either be a gas engineer or an electrical engineer. Often when you buy your oven, you will be given details on who to call for installation. Alternatively, you can find someone online. Make sure that you use someone reputable and certified, as an installation gone wrong will be extremely costly. When Do Ovens Go On Sale? New models are typically released in September and October so older cookers get discounted at that time of year to make space for new shiny cookers. There are also usually some of the best deals to be had around January. If someone has a monthly sales quota, you might get a better deal at the end of the month. Weekends can be bad if you’re going to buy in store as they will be busy and rushed. You are more likely to find the best online deals all year round, as online selling tends to be a little less seasonal. It’s still probably worth shopping in late Autumn and early winter though if you’re looking for good deals on older cookers. Use online review websites and money saving websites to help you compare big brand cookers. Why Are Ovens So Expensive? Getting one that works well and is safe to use is a feat of engineering. You are paying for the materials, but also the design and testing of prototypes. Simple enamel ovens and cookers will be cheaper than nice stainless steel or coloured ones.